These are definitely a favorite, and they are not nearly as hard as you might thin k. My only tip is be sure to use a non-stick frying pan. They aren't called potstickers for nothing. Chop Chinese cabbage. Put in blender with water and blend well. Drain. Add 1/2 teaspoon salt and mix together. Let sit for 5-10 minutes. Squeeze water out, but not to dry. Mix cabbage with other ingredients to a very fine paste. Place small amount of filling, approxiamtely 1 teaspoon, in the middle of each wrapper. Moisten edges of the wrapper and seal the edges. Heat frying pan and add 2 tablespoons oil. Line frying pan with dumplings, flat side down. 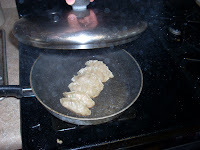 Fry until the bottom of the dumplings are golden brown, then add 1/2 cup water and cover the frying pan. Turn heat to medium. Let the dumplings steam until almost all the water has evaporated and the skins are somewhat transparent. 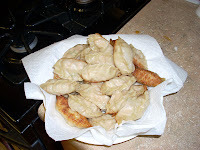 Serve dumplings with sauce made of soy sauce, sesame oil and vinegar (mix to taste). These recipes look great! Sherrie loves Chinese food, so hopefully we can successfully follow these. Thanks for putting up some pictures too.